and also a GS-13 Supervisor? This supervisor, Arthur D. Gilbert, is the same suspect who made "overt" and "extreme attempts" to insure the entry of over 8,500 pounds of cocaine into the U.S. through the Otay Mesa commercial facility back in October 1990. He is also responsible for letting the very same truck driver who drove this cocaine filled truck "walk" back into Mexico FREE while the "cocaine filled" truck was still being verified for the contraband of approximately 8,500 pounds of Cocaine. Supervisor Gilbert gave every excuse in the world to facilitate the cocaine laden truck into the U.S. This very same Customs Supervisor was eventually removed for the "good of the Service" by then Customs Commissioner George J. Weise, but was later reinstated back to Customs under Raymond W. Kelly. Supervisor Gilbert was later rewarded with a promotion and is now in charge of the Customs DCL section of the DCL program. (Documented Commuter Lane) How does THAT happen?! Supervisor Gilbert was later spotted on 8-1-00 at 14:30 hours by the Editor of CustomsCorruption.com, John Carman, in civilian clothes talking with the owner/manager of a Mexican restaurant called the Potrero Cafe in Potrero. 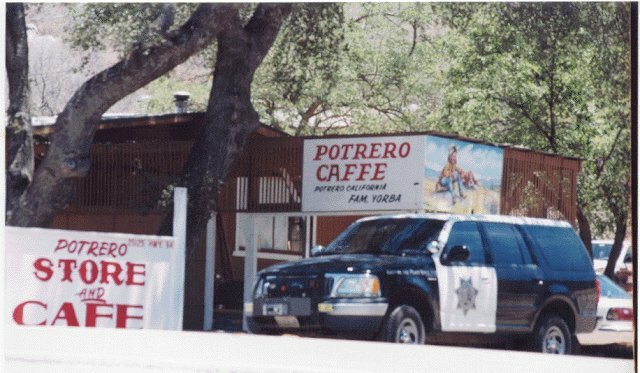 (Just east of Tecate Port of Entry by 2-3 miles) Carman was in Potrero doing a private investigation regarding a domestic welfare case when he spotted Gilbert. Supervisor Gilbert did not stop to say hello. I guess he was busy on some urgent Customs matter and had to report back to his bosses in San Diego?? ?